Optional is a new type of Java 8. I saw it before with scala and was quite impressed. You know Tony Hoare’s “billion-dollar mistake”: the null reference. How many NullPointerExceptions have you yet? The type Optional wants to fix that. With Optional you won’t get any NullPointerExceptions anymore. But it is important to use Optional the right way. So don’t disappoint Hoare and take the chance to fix the billion-dollar mistake. If you have a method with a result which sometimes may be empty, don’t return null. Even if you add a comment to your method. They will not always read it. * @return an object or else null. I think it is much better than the nested if statements. If you use all Optionals the right way, your code stays readable and you can fix some of the “billion-dollar mistake”. In a previous post I already mentioned why the architecture of IBM RTC will never scale like git. As a developer you use an SCM and probably a project management tool on a daily basis. Even small annoying things make you feel bad and are time consuming. In this post I list some reasons why a move away from RTC to git will save real money for your organisation and make your work easier. IBM RTC is not prepared to work with hierarchical structured projects. Maven is a widely used build and dependency management tool. In some cases it is important to have a hierarchical structure of your projects. Especially if you work with parent and child projects. Unfortunately RTC hinders you to check out parent and child projects in the same workspace. You can make it run but have to do some workarounds. There is also a good blog post about it by Mike MacDonagh (Working with Maven multi-module projects in RTC Jazz SCM with m2). He talks about RTC v3.x but it is basically the same as with v5.x. There are no reasons why you couldn’t do it with git. git does not know anything about a project. It is not it’s business. RTC seams to manage things that it shouldn’t. All current IDEs have git support in their basic versions. I don’t know of any Java-IDE which comes with IBM RTC integration out of the box. This means you have to install it manually. In case of Eclipse it means to download about 500 MB(!) of plugins. With every new version of Eclipse you have to wait for the new IBM plugin before you can use the new features. You got the same situation with Visual Studio, IntelliJ and NetBeans. With git you can easily compare file versions from different releases in different branches. The history view shows all very clearly (image on the right side). It is complicated to merge streams. There is really no way to compare your file from one stream with another stream until you load both streams. It is even impossible to see if the file changed in another branch. Some people say the merging process of git was better than the one with IBM RTC. Maybe I will post a direct and detailed comparison between those two tools later. This is a quick comparison between the git way and the RTC way. IBM RTC didn’t manage to create such a smooth view. Every action needs lots of server calls because you don’t have a local repository. They added a lot of asynchronous calls which lets your view update randomly. You sometimes wait for ages depending on how big your component, stream, change set or history is. 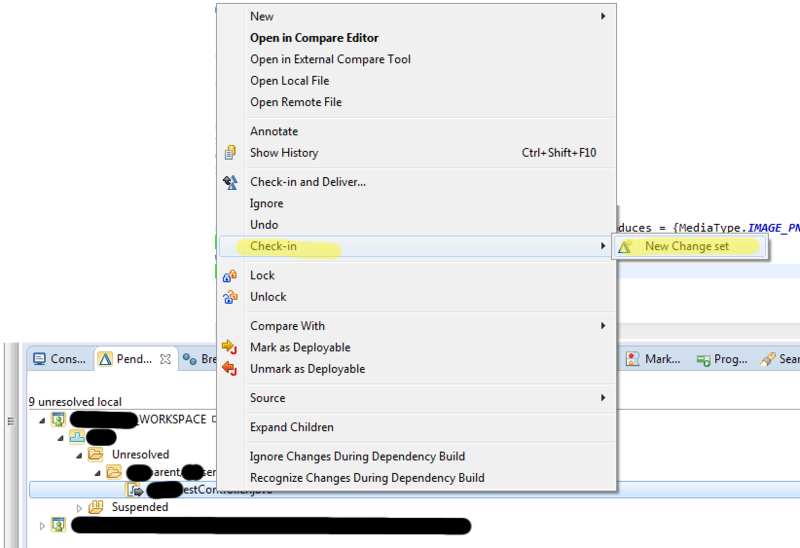 Open the outgoing folder under your stream and find your newly created change set. Either click on it once and press “F2” or wait a second and perform another click. Sometimes you have to answer some complicated questions about not checked-in changes. Then some asynchronous tasks start running and mostly after a second or two everything is delivered. As you have no local repository every interaction with RTC requires a server call. It is not designed to work offline. Git always had that use case in mind. github.com: “Social coding”. The most popular git repository. I social web ui with issue tracking and many other integrations. gitblit: Github like open source server ready to host on your local infrastructure. redmine.org: Project management web application with git integration. Jenkins / Travis: Build servers best integrated with git. Atlassian Confluence: Team collaboration for software development. You need really good reasons to make a decision against this tools and for a proprietary SCM. You will install another tool like those mentioned above if you need issue tracking or project management. They will mostly run with an apache2 or apache tomcat and a MySQL database server. Let me know if you got further pros or cons of RTC or git. I will update this post as I stumble upon more points. We use Apache Camel to glue services together. Camel Restlet can help you to translate a bean call into a REST call and vice versa. As we started using it we came to a need to add custom headers to a REST call. We thought it must be an easy job but it ended up digging deep into the Restlet source code to find a solution. But first: Thanks to Lukas Eberli for his digging. He finally found the solution! On my personal and open source projects I work for years with GIT. Some months ago my employer switched from CVS to IBM RTC (Rational Team Concert). We immediately got performance issues. I explain here why I think that RTC will never be as fast as GIT and why you should not use IBM RTC. I use Citrix to remote login to my windows computer at work. That works quite well once I installed the ICA-Client. But unfortunately the debian packages from Citrix are broken and some certificates are missing. I had to do following steps to fix it. There are a couple of things you have to do to start developing a PhoneGap app on your Linux machine. The PhoneGap documentation at http://phonegap.com/install/ looks very easy. But it does not tell you how to install the prerequisites nor does it tell how to install the platform SDK for Androd or how to run the app on your device. So I thought I write down all the things I did.